Projected Austin Weather Game Forecast: Scattered thunderstorms with a high of 86, low of 73, 78 percent humidity, and 60 percent precipitation. Friday pep rally in Austin: In anticipation of Saturday night’s big game at Texas, Dr. Arthur C. Bartner’s famous Trojan Marching Band will perform a free Friday at noon pep rally – open to the general public – on the south steps of the Texas State Capitol. From Austin-Bergstrom International Airport to Darrell K Royal Memorial Stadium: The drive time from the airport to the stadium is 19 minutes or 7.7 miles, but that’s not including gameday traffic for a stadium that holds 100,119 fans. The stadium is not far off from the freeway exits, but you know what over 100,000 fans looks like getting into and out of the Rose Bowl or the Coliseum. Austin: The state capital of Texas, Austin is an energetic town that is filled with great music venues and BBQ restaurants. The nightlife is filled with energy, and don’t forget that Austin is also home to one of the nation’s premier music events, the South By Southwest Music Festival. For visitors, the music scene is legendary; more than 250 live music venues offer rock, blues, jazz, hip hop, punk or Latino shows nightly. The Broken Spoke, known as “the last true Texas dance hall,” features great country acts – and guests can also take a Texas Two-Step lesson. The Continental Club has showcased blues, rock and folk music since 1957, earning it the title, “Granddaddy of Austin music venues.” Antone’s, Austin’s “home of the blues,” is where Stevie Ray Vaughan cut his proverbial teeth. Newer stages like those at the Mohawk and 3TEN showcase local acts alongside big-name touring artists. Where to begin? You might want to consider taking a trip and tour of the LBJ Presidential Library. At the LBJ Presidential Library, visitors have an opportunity to learn about America’s 36th President, Lyndon Johnson, one of the most complex and fascinating leaders. Through innovative exhibits, the political and personal lives of Lyndon and Lady Bird Johnson come alive. This contemporary experience allows visitors to understand the decisions President Johnson faced and experience his passion for critical issues such as education, civil rights, the environment, health care, and the arts. All aspects of Johnson’s presidency are explored, including the Vietnam War. UT Campus: Besides being the state capital, Austin is a college town, which means UT Austin is an integral part of the community. Visitors are encouraged to take a campus tour that originate in the Visitor Center, located on the second floor of Walter Webb Hall (WWH), 405 W. 25th St. Advance registration is required. Texas Fan Fest: This season, the west exterior of Darrell K Royal-Texas Memorial Stadium takes on a new feel as San Jacinto Blvd. from 20th St. to the Etter-Harbin Alumni Center is completely transformed into Bevo Blvd., an action-filled pregame street party. Named after Texas’ iconic mascot, Bevo Blvd. opens five hours prior to kickoff on gamedays. Admission is free. Stadium gates access: Gates open for access to all general seating, suites and hospitality areas at the conclusion of the Stadium Stampede (approximately two hours before kickoff). Texas Walk: See the Texas team for the “Stadium Stampede” 2-1/2 hours prior to kickoff at the north entrance to Bevo Blvd. (San Jacinto Blvd. and DeLoss Dodds Way). 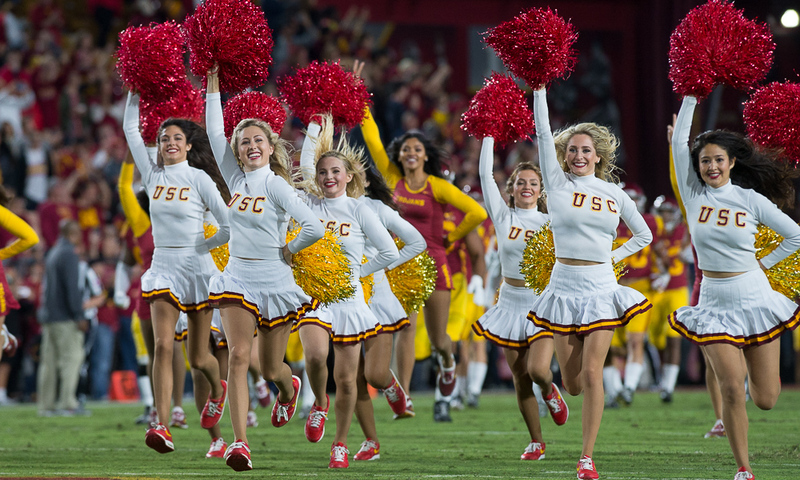 Trojan Walk: The Trojans’ team busses should roll in sometime between 4:15 p.m. and 4:30 p.m. Entrance site TBD.